This is Mackenzie’s last map. He spent his last few days (one too many!) around Head Pond near Berlin. It was obviously a good fishing spot. He did commute over to the Androscoggin too. He was fishing over the pond at 8pm and over the water at 9pm on the 20th but by 9am on the 21st his signal stopped moving. I found his remains on October 1 at that exact location. He had been predated either by a Great Horned Owl at night or a Northern Goshawk during the day. A sad end, but a demonstration of the knife edge that these birds live on – always having to look over their shoulders. Nothing much new from Mackenzie. He is still fattening up along the Androscoggin between Berlin and Milan. He hasn’t been near his nest since September 4. At 9pm last night he was perched along the river near the Industrial Park just north of Berlin. Mackenzie is commuting back and forth between downtown Berlin and the nest area. He goes for several days without visiting the nest, but stops by every once in a while just to make sure he turned the lights out and drained the pipes before he heads south. Mackenzie is spending much of his time on the Androscoggin in downtown Berlin and up to Milan. He is also visiting his favorite spot at York Pond Hatchery, Pond of Safety, Jericho Lake and Head Pond. He is only making short visits to the nest, sometimes several days apart, so I suspect that his chick and his mate have already departed and he is a free man. I’m really curious to see what route he takes when he heads south. Nothing new from Mackenzie. He continues to fish on the Paul Stream. His chick should be flying now, but demand for food will continue for several more weeks, before fall heralds their departure. No new map, as it would look just like the last one. 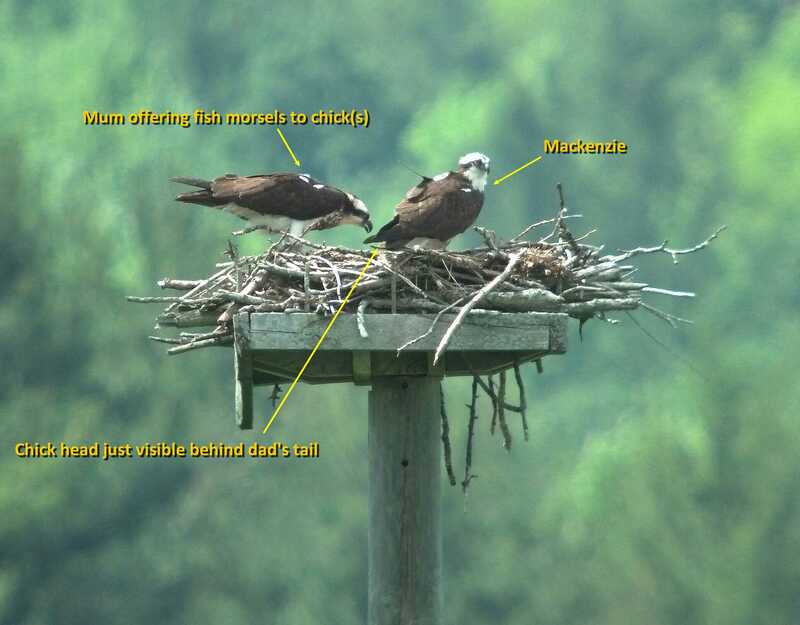 Chris Martin of NH Audubon had a chance to stop by Mackenzie’s nest this week and confirmed just one large chick in his nest. His data shows that, as has been the case for most of July, he is focusing his fishing close to the nest. Paul Stream is still his first choice and we confirmed that it was indeed stocked (on June 6) with 1,800 trout. He’s made only one trip to York Pond in the last four weeks (on July 5). All seems to be going well with Mackenzie. I haven’t been able to visit his nest to see if he has more than one chick (I suspect he does), but his hunting trips suggest that he is busy feeding a growing family. His trips over to York Pond hatchery continued through the early part of June, and he confirmed what I suspected from previous data points -- that he occasionally drops in on Pond of Safety all the way over in Randolph, 21 miles from his nest. 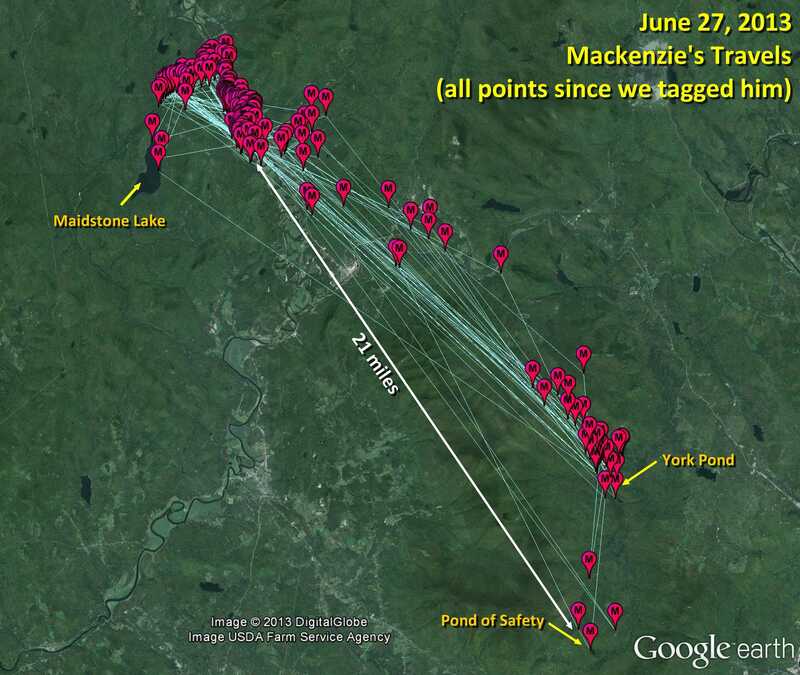 Interestingly, those York Pond trips stopped on June 15 and over the last two weeks he is fishing much closer to home – perhaps the demand for fish from multiple mouths requires less travel and more delivery. All of his fishing is along Paul Stream in Vermont (I wonder if it just got stocked with trout?) and the Connecticut River within three miles of his nest. Very interesting! I stopped by Mackenzie’s nest on Monday and confirmed that he and his mate have chicks. I saw one head clearly, but suspect at least two chicks (they had three eggs). The chick I saw was only 3-4 days old, so it’s possible that the third egg hasn’t hatched yet. A Bald Eagle cruising overhead prompted a strong vocal reaction from the female. Also, when Mackenzie arrived with a fish (at exactly 2pm) he was followed to the nest be a persistent intruding male Osprey. While I was up north, I swung by the York Pond Fish Hatchery. It is Osprey heaven. The staff there said that they see up to six Ospreys a day fishing there. While I was there, one male Osprey was working the ponds (there are several) and even the small concrete tanks. It wasn’t Mackenzie, but I can see why it is worth his while making the trek. 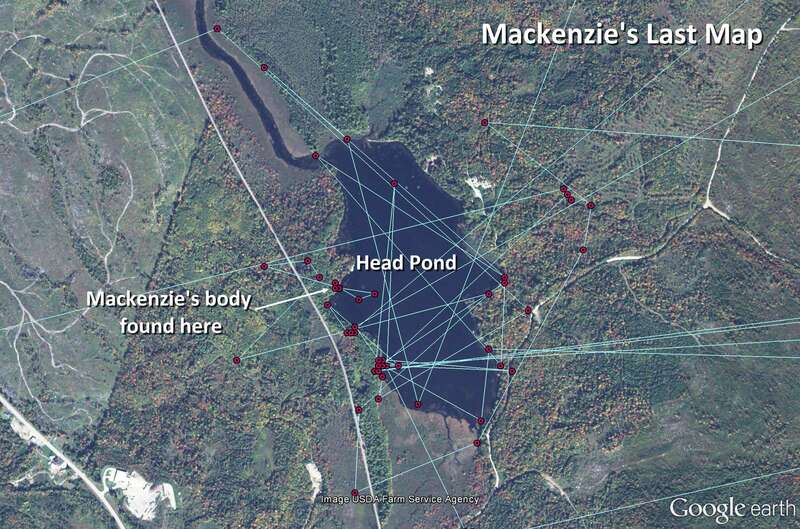 Closer to home, Mackenzie finally visited nearby Maidstone Lake in Vermont on June 1 after fishing along Paul Stream. He didn’t have any luck there and an hour later was at the fish hatchery! On May 27, Mackenzie made an interesting side trip south of the hatchery. It looks like he was on his way to Pond of Safety in Randolph. Mackenzie is showing that a trip over to the York Pond fish hatchery is just a normal day at work for him. On May 26, he made two separate visits. When he leaves there he goes straight back to the nest, which suggests he has a fish each time. His point to point travel distance that day was more than 70 miles. Mackenzie is already providing some fascinating foraging data. 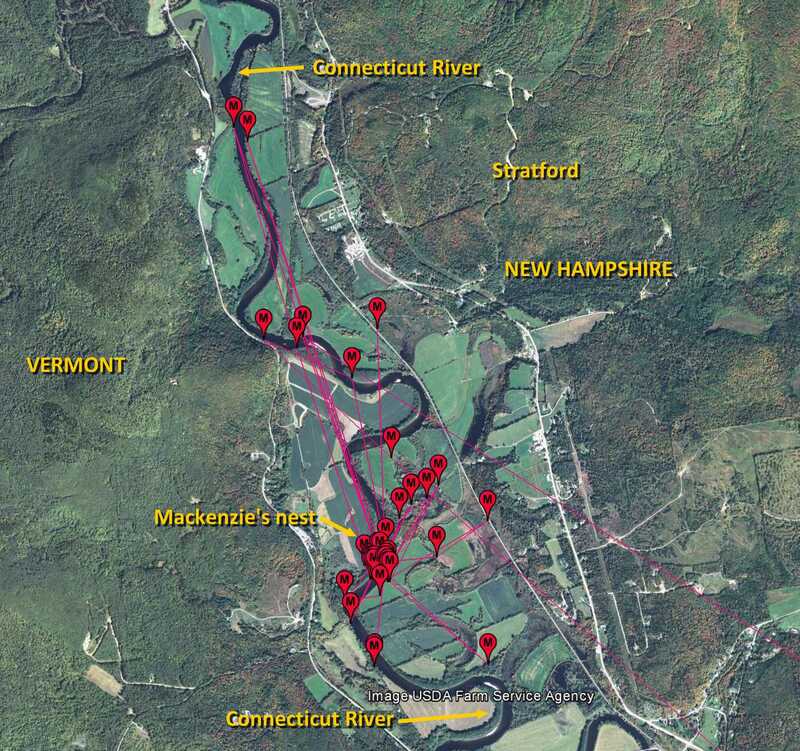 Most of his fishing trips are along the Connecticut River, BUT, he has already made two trips all the way over to the York Pond Fish Hatchery in Berlin (which is in the Androscoggin Watershed) nearly 17 miles from his nest. He visited there on the 15th and the 18th. I assume it’s worth his while. On the 18th he was at the hatchery at 2pm and back at the nest at 3pm, no doubt with a nice tasty trout.